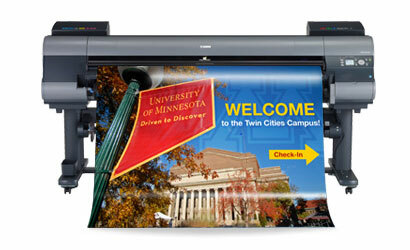 Printing Services offers high quality 600 dpi large format printing at exceptional prices. Our large format inkjet printers produce brilliant, accurate colors that are sure to enhance any event. Posters and banners are available up to 58” wide by any length. You can also have your poster laminated and mounted to foam core or Sintra for a professional, effective finished piece. Printing is available on a variety of substrates, including economical indoor papers, banner material, various fabrics, and adhesive-backed vinyl. Take your posters and event signage to a new level by utilizing one of our award-winning designers to create breathtaking and effective designs.